The operation of the application is very simple and intuitive, no complicated data entry screens or foreign concepts to learn. Preferences set by the size most appropriate to your source device, and the wallpaper that you like. It also has a handy timer that will help you in preparing your recipes. Create recipe categories as you need them and those sort them as you wish, eg first Salads, Soups after, etc. You can always reorder them again as suits you. 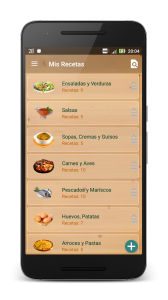 Enter your recipes, the data required are the title of the recipe, the ingredients and the preparation, you can also optionally enter Variations and Comments. You can also include a main photograph, photographs and up to 5 secondary. Share your recipes. 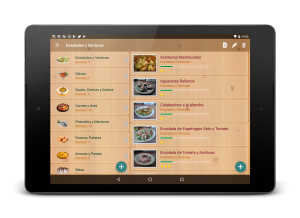 We have created a store recipes in the cloud for users of the app can share their recipes. 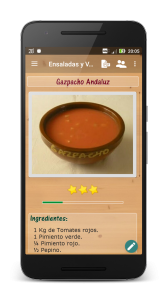 You can send recipes to store and search the store recipes that interest by category and language, see a preview, and if you’re interested, import it directly to the App. Send your recipes. 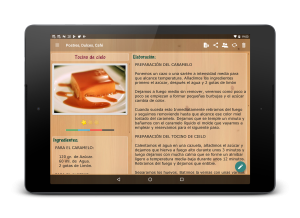 You can send your recipe and your photos via email, Google+, Facebook, Whatsapp, SMS, etc, depending on the options you have installed on your device. 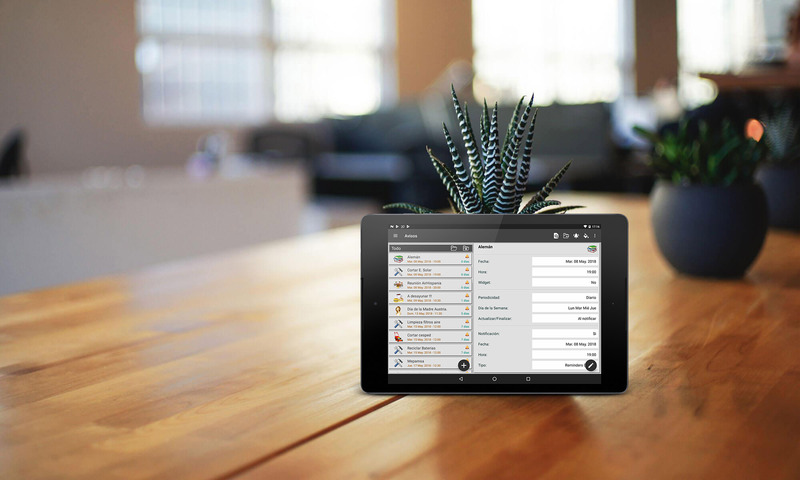 Sync with Dropbox, if you have multiple devices, or want to share your recipe book with your family, you can sync all with the same account Dropbox and thus be all updated. Backup. You can make backups to Dropbox. If you have any problems with the application, or any suggestions for improvement, please contact us by mail and we will attend the Developer quickly as possible.